This past weekend was the 6th annual Open House New York. I have been very enthusiastic about this event and have attended the past three years - see the links for my previous articles and photos below. This year I decided to take a journey to the Ukrainian Institute, owing to its description as "ornate, French Renaissance-style mansion, once owned by oil tycoon Harry F. Sinclair, now houses the Ukrainian Institute." After all, who doesn't like to visit a mansion? See photos of the interior here. The French Gothic house, known as the Fletcher-Sinclair mansion, was built in 1898 by Isaac D. Fletcher and designed by architect C. P. H. Gilbert. Read about it here in an article by Christopher Gray of the New York Times. At one time there were a myriad of mansions in Manhattan. Those who find displays of opulence disturbing because they may have been built on the backs of others, will perhaps find comfort that most of these were abandoned as private residences. I must confess, that for me, mansions are guilty pleasures. 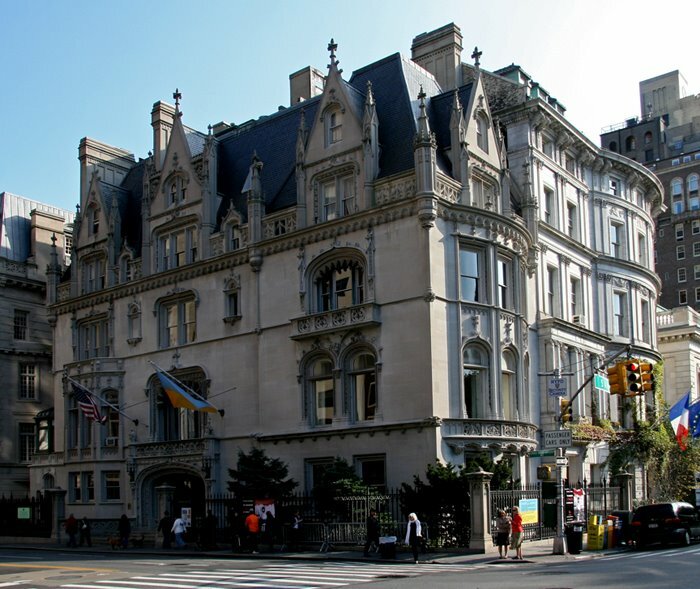 According to the aforementioned article by Christopher Gray: "Death and Taxes'' in Fortune magazine of July 1939 remarked that the Fifth Avenue mansions had become ''symbols not of power but of decay'' -- of the 72 private houses then left on Fifth Avenue, 33 were closed. The article reported that even a moderate-sized house required 10 servants at a yearly payroll of $14,000, with $4,000 alone in food for the staff. The bare minimum for keeping a house open was $30,000 a year." These mansions have been converted to other uses such as embassies, museums, institutions and high profile retailers. Whether one sees these uses as more socially acceptable is one issue; certainly it is nice that most of these can now be used and enjoyed by the populace. The Ukrainian Institute of America took over this property in 1955. Their function is to develop, sponsor and promote through activities a greater awareness, understanding, knowledge and appreciation in the United States of the art, literature, music, culture, history and traditions of Ukraine.